To provide you with one of the best products available at a reasonable price. We do a little of everything. Vinyl graphics, printed graphics, printed banners, printed magnets, printed posters. Let us know what we may do for you and your business. The Red Robin banner was printed for their Curbside To Go promotion. Hershey, PA Restaurant. 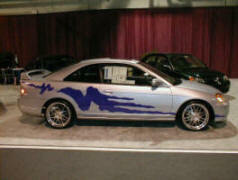 Silver Honda Civic with purple graphics was a promotion with Faulkner Honda and part of the Auto Show in Harrisburg, PA. Copyright © 2007 Ingenious Designs. All Rights Reserved.